Silverstone's mix of corners make it a good test of the abilities of car and driver, but overtaking is difficult. Becketts and Copse, in particular, are daunting tests for man and machine - and provide spectators with a glimpse of an F1 car's awesome capabilities. Following some much-needed investment, Silverstone has made efforts in recent years to improve its facilities. 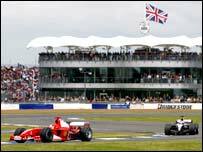 But with F1 in Britain moving to Donnington from 2010, Silverstone looks set for a period out of the limelight.